Increase light reaching your eye or camera chip by as much as 65%! It's the equivalent of buying the next size bigger scope. Visual observer? 2" eyepieces are "where it's at" for widest field of view. This 3rd generation EyeOpener enhances the performance of long focal length 2" eyepieces on Meade 10", 12" and 14" SCTs by increasing the optical path size from 1 1/2" to 2". Get all of the eyepiece aperture that you paid for and enjoy the full benefit of 2" eyepieces. Imaging? With all but the smallest (oldest) chips, all SCT camera setups suffer from vignetting (darkness at the corners of the image). 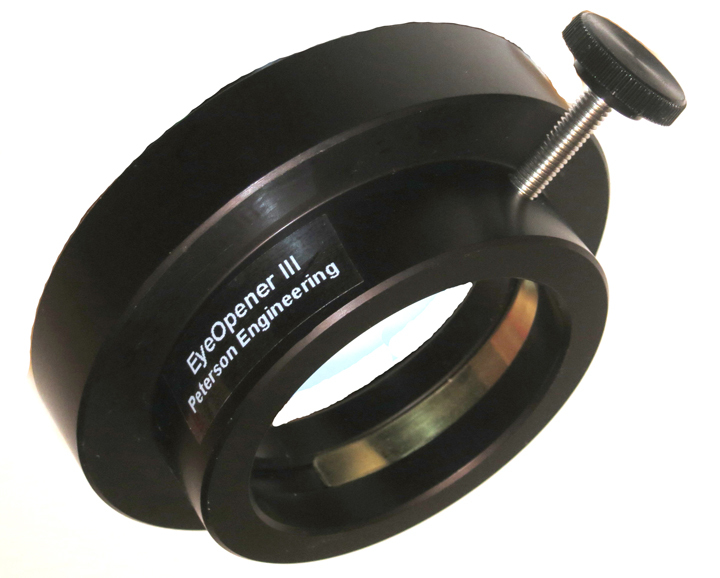 Increasing your scope's optical path from 1 1/2" to 2" in diameter is almost mandatory for today's imagers. The EyeOpener directly accepts a 2" diagonal, 2" eyepiece, 2" tube-end focusers and any other 2" tube used in an optical train. It threads onto a 3-1/4" male thread found on the backplate of 10", 12" and 14" Meade SCTs. scopes, providing a full 2" unrestricted optical path. Unscrew your 1-1/2"visual back and check it out for yourself. To mount Meade's Zero Image-Shift electronic microfocuser you will want the EyeOpener II. History: As Schmidt-Cassegrain Telescopes (SCTs) evolved from 8-inch models to larger-aperture scopes, and as eyepieces evolved from 1" to 2", the "Schmidt-thread" couplings used for securing 1- inch diagonals and eyepieces to telescope backplates remained unchanged. This "Schmidt visual back" supplied with Meade (and Celestron) SCTs has an internal diameter of 1", and it functions as a 1inch-diameter field stop. This field stop effectively limits the performance of modern 2" optics to the equivalent of 1" optics. When using the 1" visual back with Meade's 2" 56mm Plossel (an eyepiece with a full 2" of glass in the nose) you loose 65% of the light to your eye! For imagers, the same holds true for your camera chip.